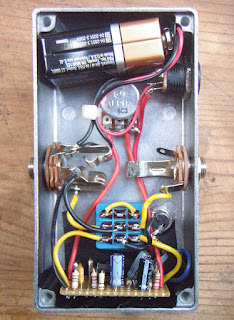 I don’t often build more than one of the same pedal. 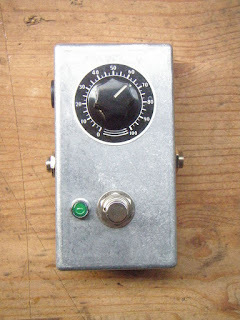 In fact, I think the only one I’ve ever built twice was the Minimixer (http://diystrat.blogspot.com/2008/08/two-channel-mini-mixer.html), but I don’t think that even counts as a pedal. 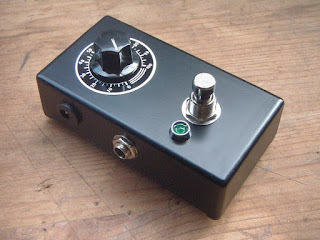 Christian over at Black Sunshine Media was so enamoured with the Volumizer, however, that I offered to build one for him too. I also took the opportunity to do a better blog post about it, since at the time of doing the original one, I kind of skimmed over some important points. Firstly, some background. The Volumizer is my clone of an MXR Micro Amp, the schematic of which can be found at General Guitar Gadgets. 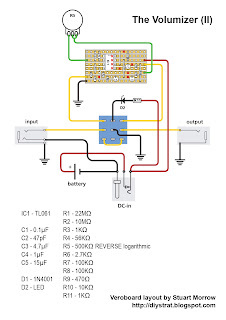 There is basically no difference between my circuit and the one shown there, apart from the layout and possibly a couple of very slightly different parts (due to a lack of local availability). 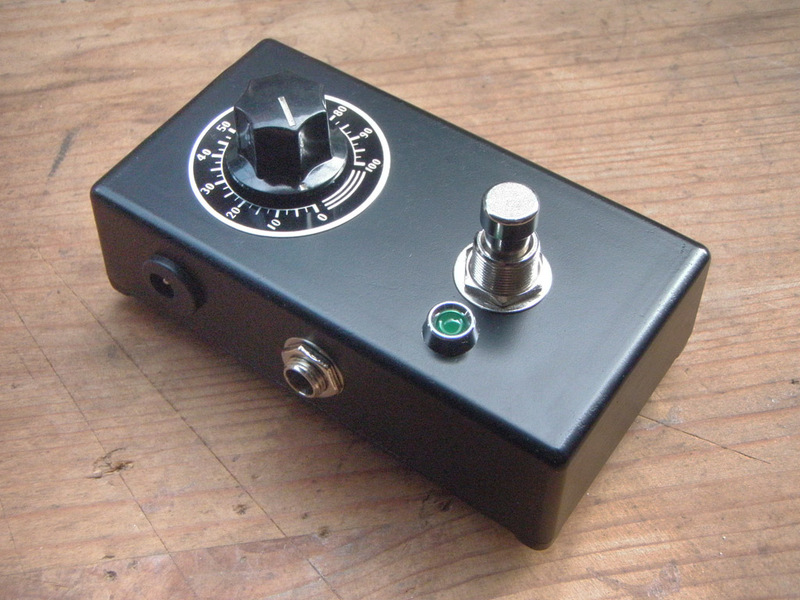 This pedal is a great little pre-amp, which boosts volume and nothing else. 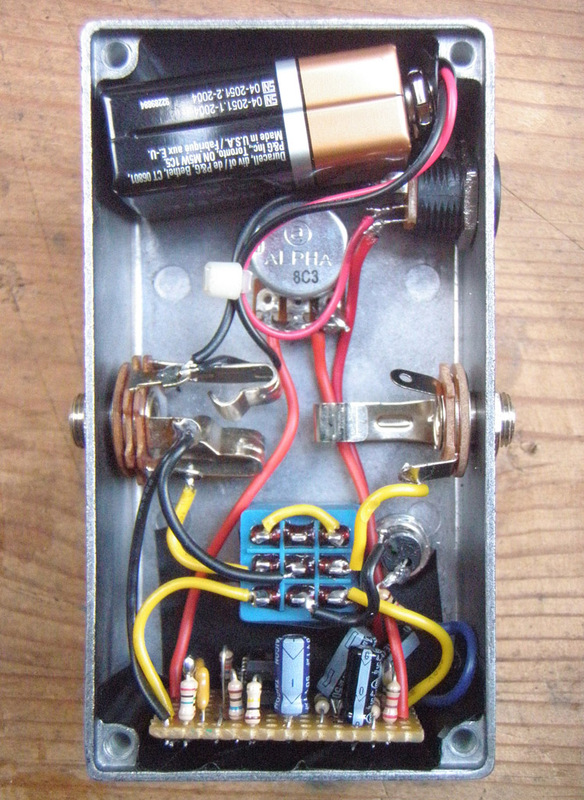 It’s nice and clean and only provides distortion if you use it to drive something else (which would be what actually distorts, not the pedal itself). Christian’s found it to be extremely useful as a pre-amp stage before going into his mixer, which was a use that I hadn’t even considered when first making it. Also, this time around I managed to source a more standard-sized enclosure, since I really had to cram the other one into the slightly smaller box. OK, let’s build this thing. 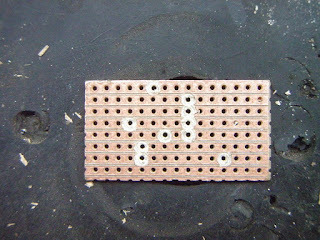 First we need some veroboard cut out to 15 x 8 (you may want to make it a little longer to allow for more capacitor space – explained later). Then we cut the tracks as noted by the red X’s on the verobard layout. 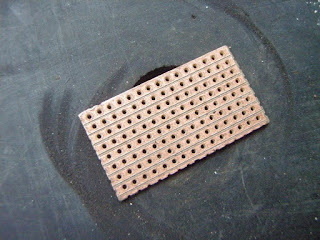 Just remember that you’re cutting these on the back, and the veroboard layout is as seen from the front. Here’s mine after cutting the tracks. Incidentally, if you’ve been following my posts, you’ll have noticed that I’ve been trying different methods for cutting veroboard tracks. I finally came up with a solution that I’m happy with. 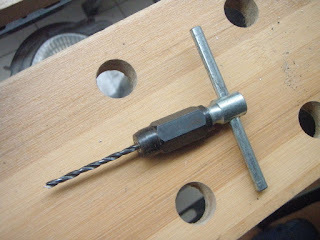 This is a pin vice with a 3mm drill bit. It works really well for cutting the veroboard tracks. This is going to be my go-to tool from now on. 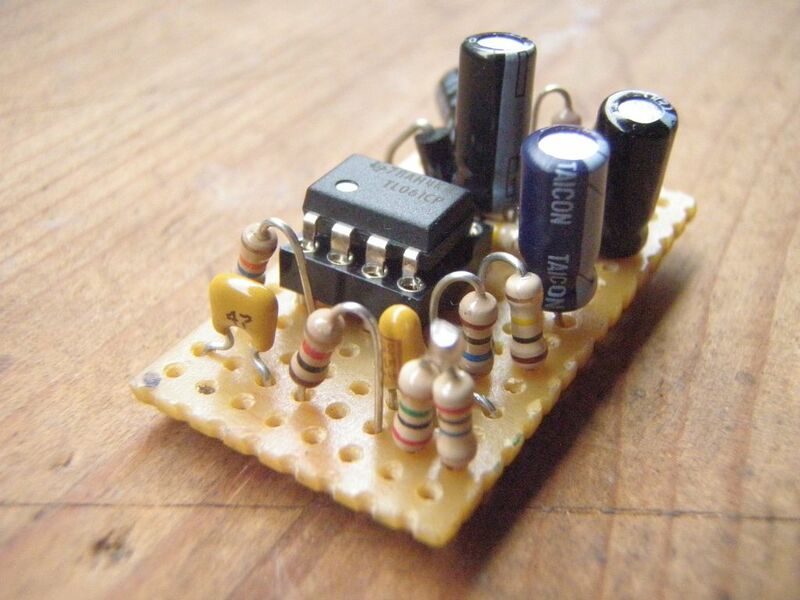 All right, the veroboard’s ready to receive components, but before I do that. 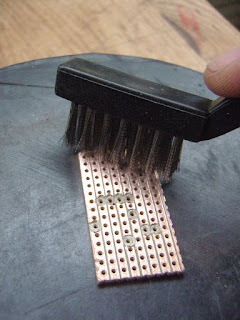 I’m going to give it a scrub with a steel brush, since it’s a bit tarnished (a brass brush, sandpaper, etc, would do this job just as well). 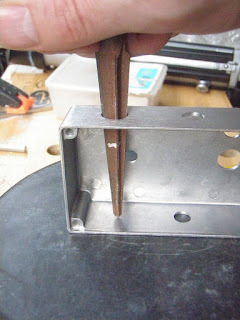 I’m doing this because it will make it much easier for the solder to take hold. 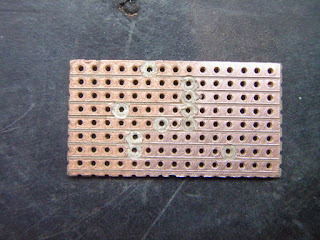 Here are the parts soldered in place. 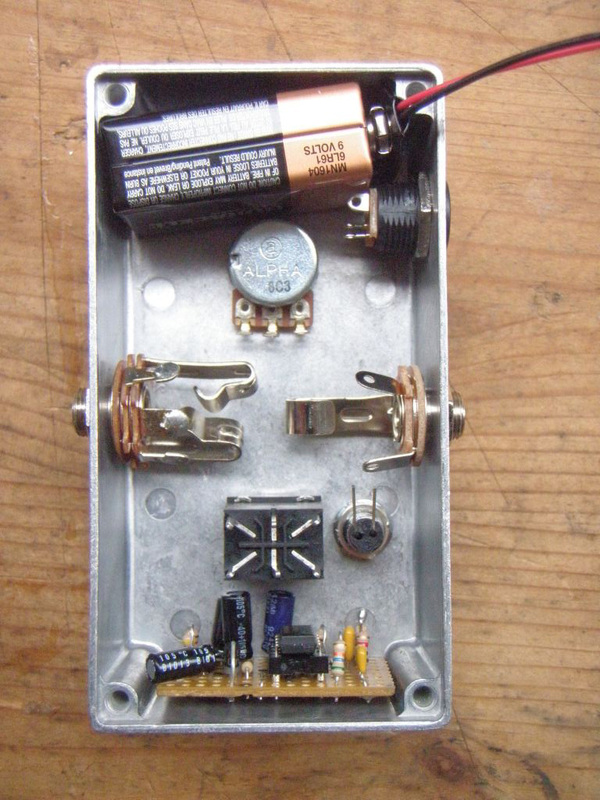 You may notice an additional capacitor sitting at a funny angle to the top right. That’s because I couldn’t source a 15µF one, so used a 10µF and a 4.7µF one in parallel, giving me 14.7µF (close enough). That’s why you might want to leave a bit of extra space when you initially cut out the veroboard (or you can just cram it in there like I did). 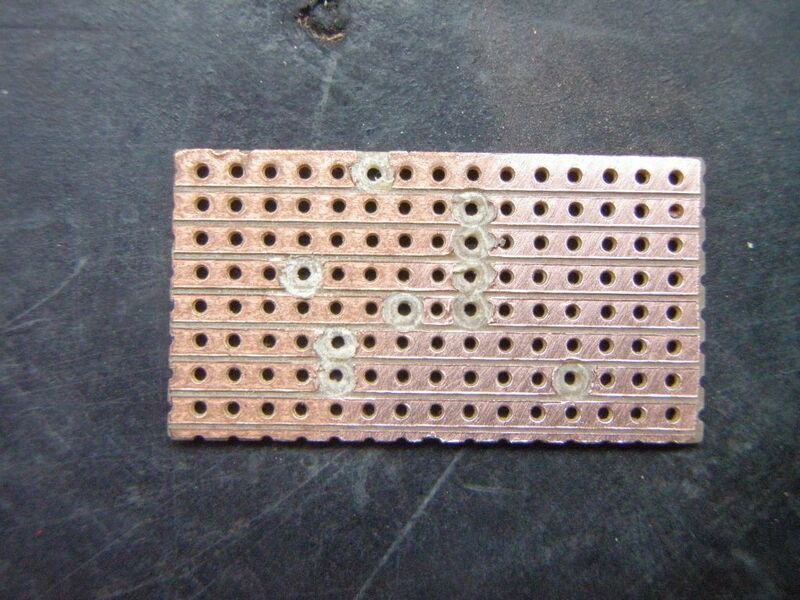 Also to the lower left, you might notice that I have two resistors soldered together,. 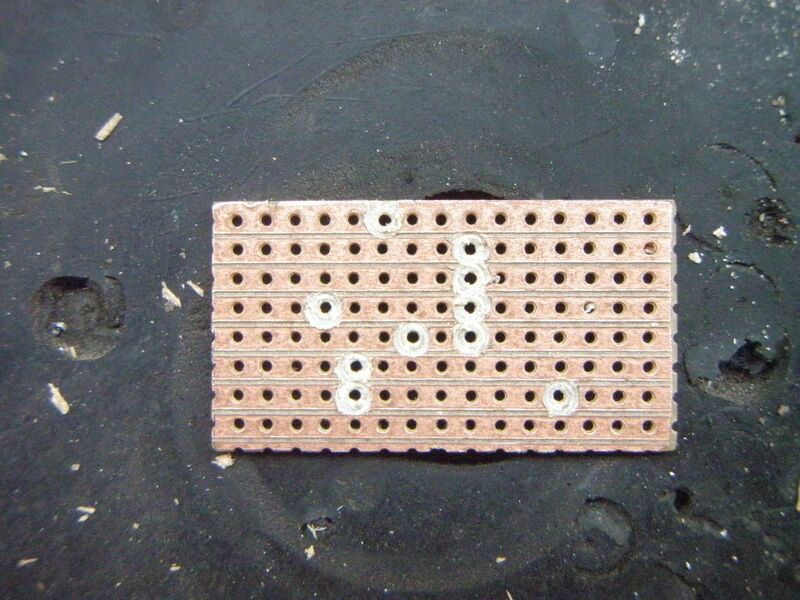 These are a 2MΩ and a 200KΩ resistor soldered in series to make the total value 2.2MΩ. Now we deal with the box. I mark the holes on the plastic wrapping (which saves a bit of cleanup), and stamp the centres with a hole punch. After that, I drill the holes with a stepping drill bit. 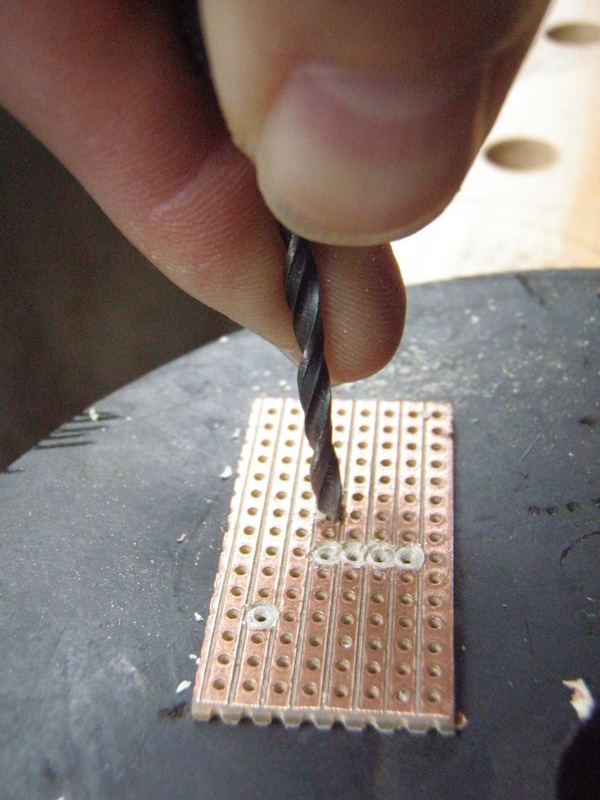 If I feel that the drill bit is hitting the back of the enclosure, then I wait till that’s off before finishing the hole. 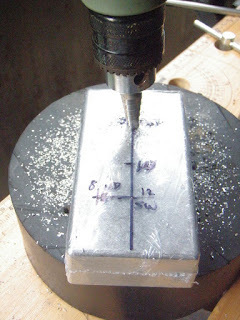 The DC-in jack hole is a tad wider than 12mm, so I drill to 12mm and then ream it out just a little more. I do a test fitting with all the parts before taking this any further. I was still waiting for some new 9-pin stomp switches to arrive when I took this, so had to settle for a 6-pin one in its place temporarily. Once I’m happy with the layout, I remove everything and then paint the box. This one’s getting flat black with no decals. Wait, what the…? I thought I took some photos at this stage. I guess I just got so excited I forgot. Picture this: That box I just drilled holes in is sitting on a newspaper. To the right, I am spraying black paint out of a rattle can. Said black paint is landing on the enclosure and turning it... black. OK, now imagine I took a photo of that and you’re looking at that photo right now. inside and wire it up (you’ll see the 9-pin switches had arrived by this stage – hooray!) 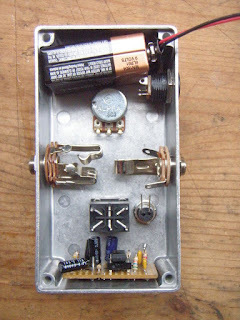 You will also note, no doubt, that I have also put some insulation in there so that the circuit board does not touch the metal enclosure, causing a short. I do a quick sound comparison with the original Volumizer and confirm that they sound the same (they do). Oh wait, that’s upside down. How about this? It's me, as i impend, starting to ask a load of questions. First i want to tell, that i really love your stuff. I read your posts about the boosters and the miniamp (the coolest thing on earth) and i thought a lot about a pedal i really would like to have. Actually i wanted to buy the mrx booster. But now i make me my own. Even better. I think about building a big padal with the two boosters in.2channel. And on top the minimix. 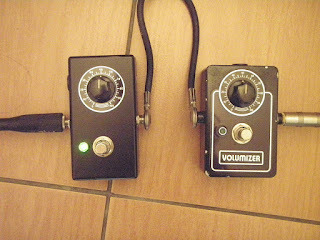 With a on/on switch for direct out (2 in 2 out) or to use the minimix. 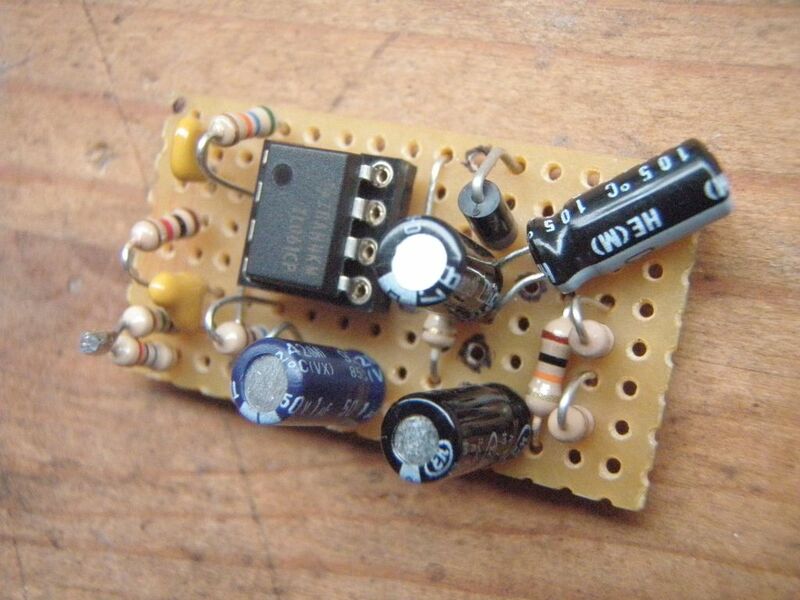 Do you think its possible to do that with just one 9v plug? Can i split tnat? I hope so. That would be the perfekt thing for me. 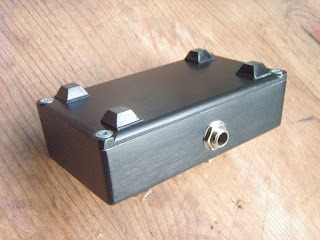 The enclosure you used for the volumizer, ist it tne sam2 size as the minimix? Ist this the right TL061? And the pot! Is a log pot right? Or is there any reverse log pot? Or did you say reverse because it is just different to a lin pot? I can not send you jpeg with this post, do i? Thanks a lot for helping me so far. You spore about mm in posts. So you are from Europe? 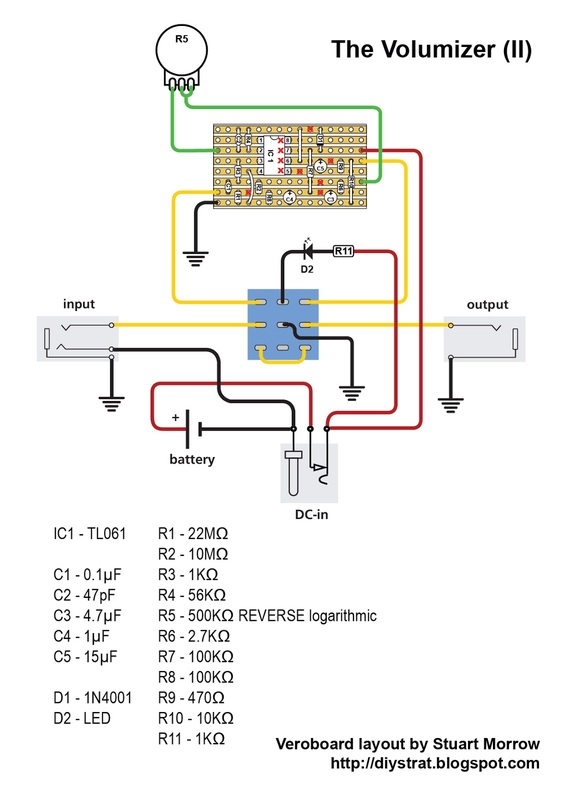 Another Question: which wire do you use for all these circuits? Mine is solid and not flexible with a verry thin coating. Would like to have a more flexible one. Maybe you can send me a link with the specs? Ok thanks, i'll do some sketch and get back to you. Hope i got it right, this is a anti spambot thing in your mail adress? Yeah, that's right. Just take out the bit it says to take out.